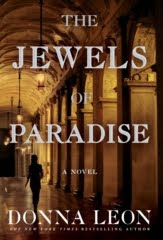 I received a digital copy of Donna Leon's new novel, The Jewels of Paradise, from NetGalley and began reading it without having any prior knowledge of the book or its history. For a while, I kept expecting Commissario Brunetti to pop up somehow, but gradually I figured out that it's her first non-Brunetti novel. It's part of a larger project on which she collaborated, dealing with a production of Baroque opera (which is in fact her real interest in art and life). The story is a novelty in one other sense, her main character and the person through whom we see nearly everything is a woman, an Italian native who has been pursuing an academic career outside Venice for a number of years and is tempted back to her native city by an offer of a temporary job, assessing the papers of a lesser-known Italian composer of the Baroque era. She quickly becomes embroiled in a web of family and greed that readers will recognize from the Brunetti books: Leon's view of contemporary Italian society is unromantic. But the primary intrigue is what she finds out about the composer's life through his papers. Leon has used an actual composer (I won't give his name because part of the intrigue at the beginning of the book is whose papers are being researched and why). There are crimes in the book, though mostly in the composer's life, as he struggled with personal, religious, and political situations beyond the scope of his musical career. 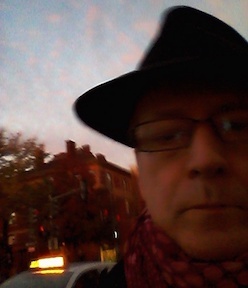 The resolution of the book in the present day grows organically from that nexus of the composer's interests. I found the book to be fascinating, and the research intriguing. It's not a thriller or even, in the usual sense, a mystery or a crime novel. But there is plenty of tension, and the satirical impulses evident in Leon's other books are deployed even more here. It's also interesting to see what Leon can do when freed from the usual structure and cast of characters. I read the book on an iPod Touch, and it's a testament to the story and to the quality of the writing that I didn't feel any strain at all in reading the novel on such a small screen.